Why do you need local meetups and how does this contribute to your business’s growth? Today James shares some insights about attending a local meetup and what is involved. 00:09 – Why do you need local meetups? 00:45 – What is a meetup? What are local meetups? [Click To Tweet]. This is not a solo sport, this is online marketing. [Click To Tweet]. Get the drive to step up! [Click To Tweet]. Hey James Schramko here and I’ve just checked in to a hotel here in Melbourne where I’m visiting a local meetup. Why do we have local meetups? Now why do we have local meetups in our SuperFastBusiness community? It’s because this is not a solo sport, this is online marketing. You need to have friends, you need context, you need networks, you need joint ventures, you need suppliers, you need customers. And a great way to get those things is to come together and use the collective brainstorm of all the other people who are in the community and leverage off each other’s thoughts and ideas. I come so that I can share ideas, but I also come so that I can listen and find out what our community needs, and then I put that back into the community. So what are these meetups? They’re simply a member-organized get-together, usually in a pub or a restaurant, where people actually sit down, have a few drinks, and have discussions. Now I’ve been to these things all around the world. I’ve been to them in Dubai, and the USA, and the UK, and of course in Australia. So Melbourne and Sydney are quite strong communities. There’s around 30 people go to these meetups. And they happen pretty much every single month. But if I’m travelling in your area, then I’ll make sure that we have a meetup. Just a few weeks ago, I had a meetup in Sta. Monica and I took our California members out to dinner. 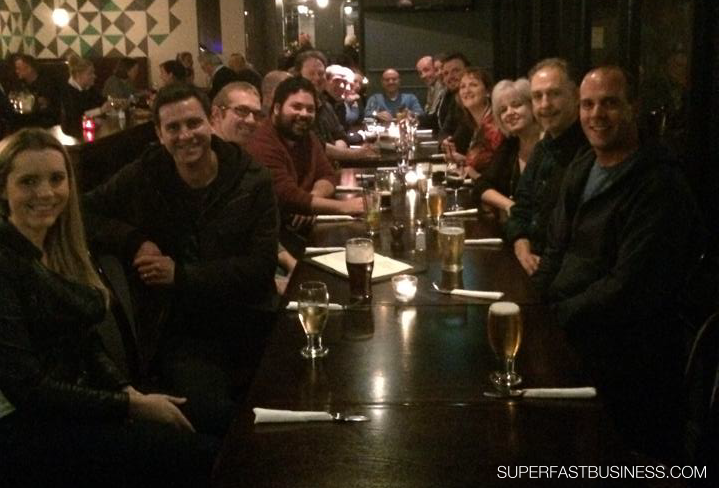 So meetups are great to get to; they’re part of SuperFastBusiness membership. If you’re a member of SuperFastBusiness membership, go into the local meetup section. Organize to go and meet your peer group at the meetup. You’ll be able to go to a dinner, or have a drink with some other people who know exactly what you’re talking about and it’s not some foreign language, and you’ll get the peer support that’s going to drive you through to the next stage in your business. I’m James Schramko, thanks so much for watching this, and I hope to see you face to face at a meetup soon. Thanks for coming to cold ‘ol Melbourne town James for the meet-up! Your question at the table:”What would your life look like if you had $10,000,000 in the bank?”, has motivated me to start planning my life for when that day comes! It’s a looo-ooo-ooong way off yet, but it’s time to start thinking with a 10x mindset!! It was great to chat again Greg. Great question with an answer that challenges WHY you do the things you do.